At Horizon, we focus on quality design, construction and user experience. We're not worried about producing 300 smokers a day like the light weight smokers sold at most big box stores. Our goal is to make the absolute best smokers in the world and that is EXACTLY what we do. Horizon is the most trusted name in traditional smokers. As a three time World Champion, with dozens of state level championships, Horizon owner and CEO Roger Davidson wants to help other aficionados reach the level he's achieved. Horizon seeks to equip people with the tools and the knowledge to become the best barbecue cook they can possibly be. 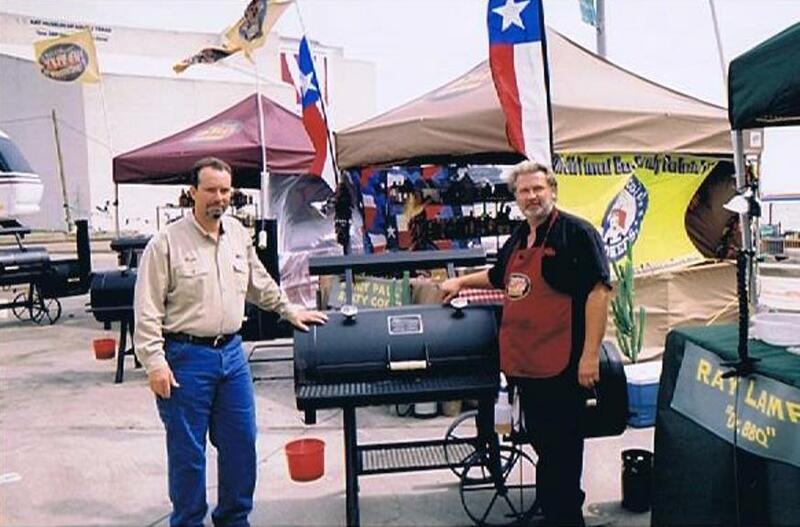 American Barbecue Pioneer, Roger Davidson, has been designing and manufacturing high quality wood burning barbecue smokers since 1989. As the Co-Owner/ VP of the original Oklahoma Joes Smoker Co, He traveled all over this great country of ours competing in Championship BBQ Cooking Events. His competition resume includes3 World Titles ( Jack Daniels, American Royal and the World Pork Expo BarbeQlassal) along with Dozens of State and Regional level championships. After the sell of OKJ's to Charbroil, Roger was hired by the Brinkmann Corp to open and manage a new factory for them that would produce the highest quality smokers that Brinkmann had ever produced. At this point Roger had over 14 years of Smoker Manufacturing and Competitive BBQ cooking under his belt and was ready to open his own factory. A new Smoker Company where he could take his expertise in the field of Barbecueing to the next level. Horizon opened it's doors in 2002, in Perry, OK. With almost 2 million smokers under his belt from co-owning and managing two other well known smoker companies, Roger Davidson seized the opportunity to open his own smoker factory. Keeping to his philosophy of building top quality smokers instead of huge quantities, Roger brought back a dozen of his former Oklahoma Joe's employees and started turning out the Best Built Smokers in America. Since it's start in 2002, Horizon has been recognized world wide as the gold standard in traditional offset firebox smokers. Horizon has been featured in several magazine articles including: "Bon Appetit," "Food and Wine," "Oklahoma Today," "New York Magazine," and most recently Horizon was featured in "Esquire" as part of their list of "Great American Things". Out of 45 singular products made in the USA, Horizon Smokers was named No. 28. Horizon has also seen several television appearances, such as on Bobby's Flay's "Boy Meets Grill." Horizon was featured in the first ever barbecue challenge tv show, "All Star Barbecue Showdown." 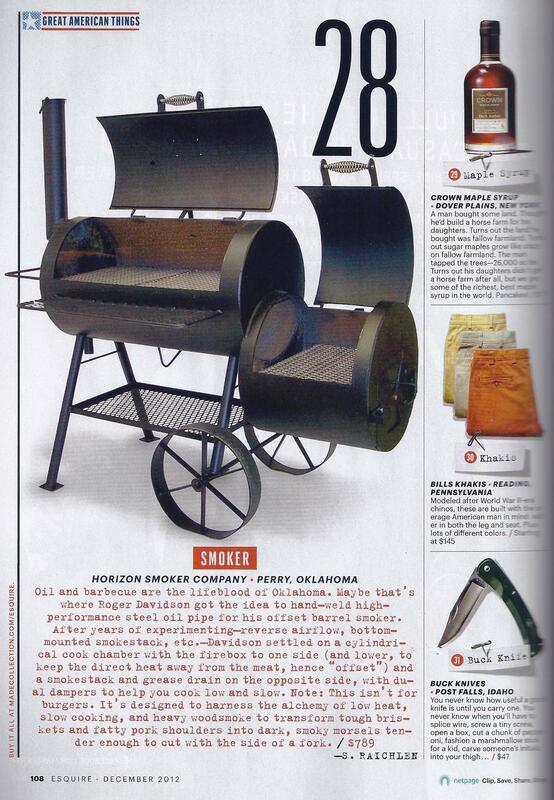 Since then, our Trailer Smokers have been used by our teams on episodes of "Pit Masters." 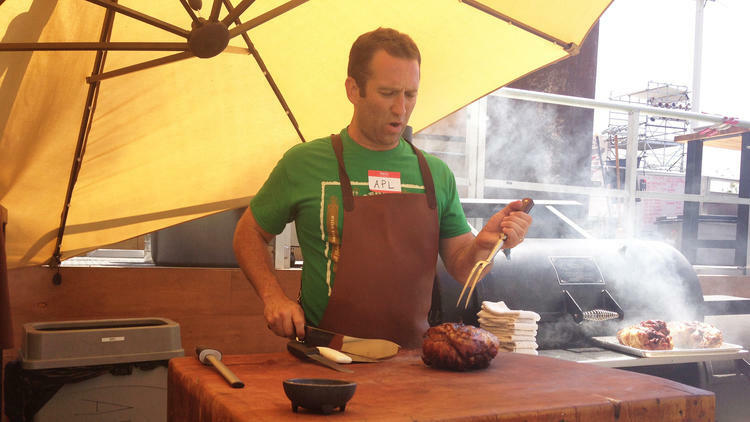 Horizon Smokers appeared on the Jimmy Kimmel Show, first in 2014 with Chef Adam Parry Lang and again in 2015 with Chef Aaron Franklin cooking on one of our Horizon 24" Marshal Smokers. 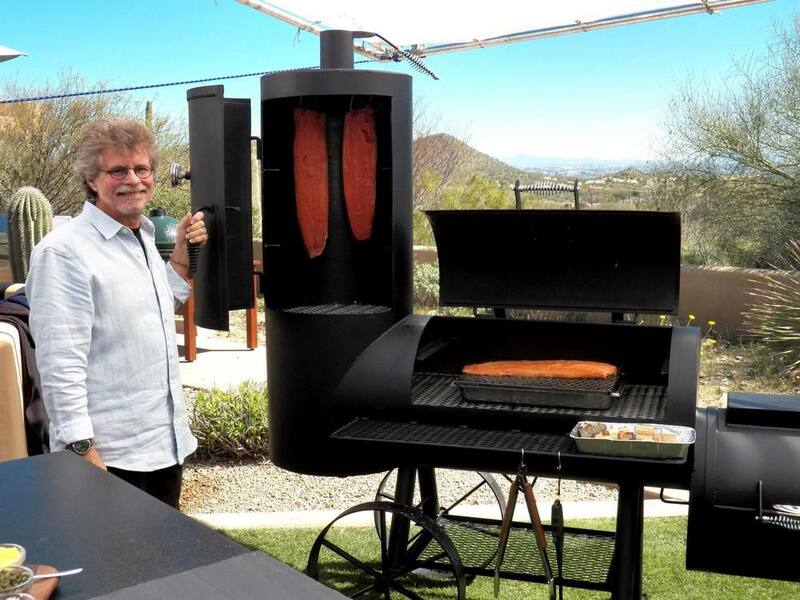 Television celebrity and author of countless barbecue cook books, Steven Raichlen, uses Horizon Smokers on ALL of his television shows. He also exclusively uses Horizon Smokers for his Barbecue University cooking classes.